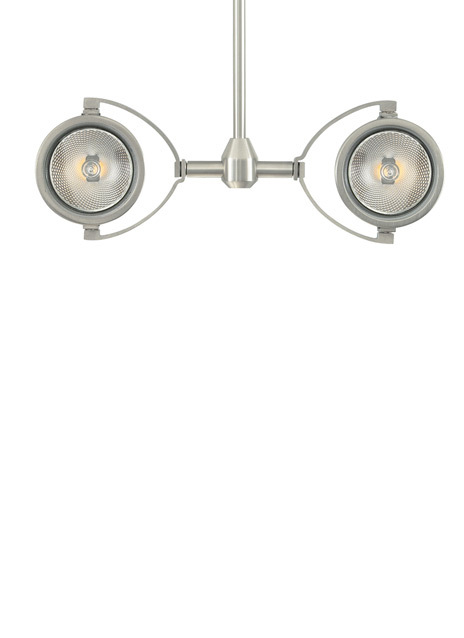 The Elton display head by Tech Lighting combines design simplicity with practical technology. This simple display head puts light where you need it the most featuring double heads that rotate a full 360° and pivot 360° to direct light beam to the desired location. The Elton head is available in three on-trend finishes and can be customized to hang at five distinct stem lengths. Diversify the overall look and feel of the Elton by combining with the complementary Monorail or Monopoint systems by Tech Lighting. This low-voltage display head is ideal for commercial lighting applications such as retail stores, libraries and galleries. The Elton ships with an integrated lens holder to accommodate a fully dimmable MR16 lamp (sold separately). Integral louver lens holders can hold a single glass lens (sold separately) or an eggcrate louver (two included). Two low-voltage, MR16 lamps of up to 20 watts each (not included).